American Civil War battles were fought using the same tactics that were used during the Revolutionary War nearly a century before. The primary infantry formation was the line of battle and was used primarily in the attack. To form into the line of battle, the men stood shoulder to shoulder in two lines called ranks. The two ranks were 13" apart, or the distance from the back of the front-rank man to the chest of the rear-rank man. The front-rank man and the man standing directly behind him formed a file. The formation relied heavily upon the bayonet. The line of battle would advance, with bayonets fixed, to about 50 - 100 yards from the enemy and would fire a volley (each man firing at the same time) into the enemy's ranks. This way, the attacker was able to compensate for the smoothbore musket's short range and poor accuracy by concentrating the maximum amount of lead into the enemy to ensure that some of the bullets would hit. Without reloading, the attackers would then rush towards the enemy's lines and fight them with the "cold steel" of the bayonet. Usually, one or more companies were placed in a single line forward of the regiment as skirmishers. If the regiment was attacking, the skirmish line prevented the regiment from being ambushed and showed the commander where the enemy was located. If the regiment was defending, the skirmishers would force the enemy to deploy, slowing them down and disrupting their attack. By the start of the Civil War, however, the new weapons had made the old Napoleonic linear tactics obsolete. The tactics were created when the best longarm was the flintlock smoothbore musket, with its 50-100 yard range, and the artillery was short-ranged and inaccurate at best. In the intervening years, artillery had improved so that attackers were under fire for nearly a mile. The increased ranges of the new rifles and rifle muskets meant that the defenders could begin firing at 200 to 400 yards. 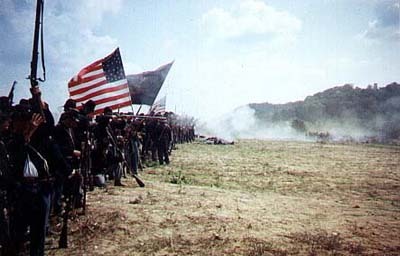 Many times, bayonet charges stalled or were repulsed before the attackers could get within range to charge (see also Battle of Gettysburg, Gettysburg Campaign, and Fredericksburg & Spotsylvania). If the attack stalled, a stand-up fight would ensue, with the two lines trading volleys at a distance of 100 - 400 yards . Only when the attackers had overwhelming numbers, or they caught the defenders moving, were bayonet charges successful (Chickamauga & Chattanooga). Commanders were slow to adapt to the new technology, since they had used the tactics successfully during the Mexican War. They did not understand the new weapons and refused to dispense with the tried-and-true tactics of Napoleon. Military leaders held so tightly to the idea of the massed bayonet charge that during the First World War they advanced shoulder-to-shoulder, with fixed bayonets, just as Napoleon did 100 years earlier at Waterloo, even though they were facing an enemy armed with modern repeating rifles, machine guns and airplanes. WHY DID THEY FIGHT OUT IN THE OPEN IN THOSE LONG LINES? Why did the armies fight in those long and exposed lines and not seek cover in the woods? It seems illogical to us, and many historians remark that it was practically murder for the commanders to expose their soldiers with such tactics. But there were factors that forced the 19th Century battlefield commanders to apply those tactics. Three of the most decisive factors were the smoothbore musket, type of powder used, and lack of modern communications. As previously stated, the infantry of the 18th and first half of the 19th Century was armed with the smoothbore musket. This weapon was short ranged and terribly inaccurate. In order to ensure some hits on the enemy's ranks, commanders were forced to group their men in the compact formations and fire point-blank volleys. 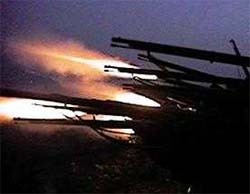 All weapons of the period, both shoulder arm and artillery, fired black powder which created huge clouds of white smoke. Depending upon the amount of wind and the terrain, a battlefield could quickly become obscured and visibility could drop to virtually zero. This was the case in Morgan's Woods and Tanyard Hollow at Pea Ridge. As well as being obscured by smoke, battles were incredibly loud affairs. Witnesses reported hearing the Battle of Pea Ridge as far away as Springfield, MO (80 miles away). Some battles could be heard between 100 and 150 miles away. If a battle could be heard 100 miles away, imagine how loud it was 100 feet away! Try to put yourself in the place of a regimental commander trying to order his unit into battle! You can barely see from one end of your line to the other. You have to shout just to be heard a few feet away. Since modern battlefield communications are 70 years in the future, you have to rely on runners, drum or bugle calls to communicate. If you spread your troops out, they will get lost in the smoke and will never hear the orders to advance or retreat. If you put them in the woods, the smoke will never clear out and you won't be able to see the enemy. Your only chance is to stand in the open, in a tight, compact formation, where you can control your troops and where the wind can clear the smoke away from your troops. See also Napoleonic Tactics at the Battle of Gettysburg. "My God, what a slaughter! 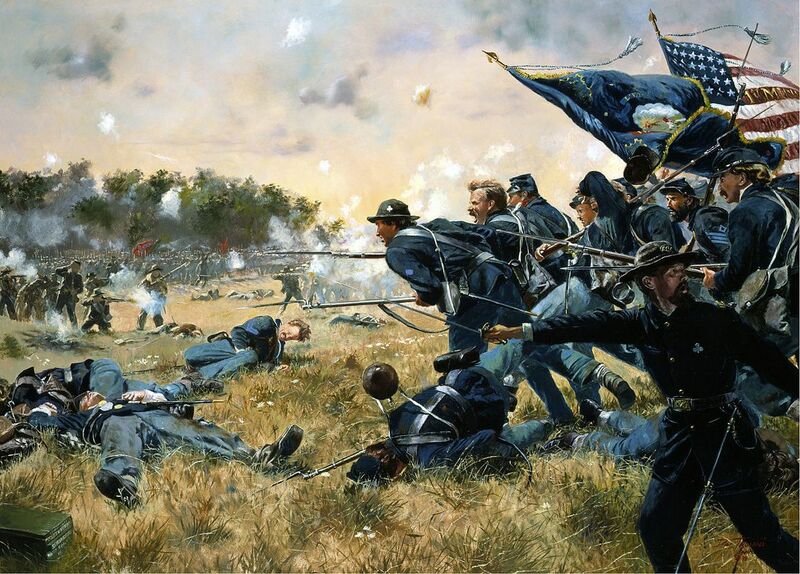 No one appeared to know the object of the fight, and there we stood for one hour, the men falling all around..." Captain George Fairchild, 7th Wisconsin, after the Battle of Second Manassas. From the early battles that relied on muzzleloaded weapons, to the introduction of submarines, handguns, shoulder arms, edged weapons and more, this book chronicles the history of an innovative age of weaponry. Weapons including the Butterfield Revolver, Sharps Model 1859 and Confederate short sword are shown in detail, with a performance summary. This unmatched reference provides the information needed for a historical study and collecting. The Civil War buff and even serious collector of Civil War arms, uniforms and equipment should purchase the Civil War Collector's Encyclopedia: Arms, Uniforms And Equipment Of The Union And Confederacy as an indispensable reference and core guide in this specialized area of military antiques and collectibles with noted authority Francis A. Lord covering almost everything to do with Civil War memorabilia--from equipment to Union and Confederate uniforms. Sources: Official Records of the Union and Confederate Armies; National Park Service: American Civil War; Walter Clark, Histories of the Several Regiments and Battalions from North Carolina in the Great War 1861-1865; National Park Service: American Civil War; Weymouth T. Jordan and Louis H. Manarin, North Carolina Troops, 1861-1865; D. H. Hill, Confederate Military History Of North Carolina: North Carolina In The Civil War, 1861-1865; Library of Congress; North Carolina Office of Archives and History; North Carolina Museum of History; State Library of North Carolina; and National Archives and Records Administration.